Light quality is the driving force behind ETC's LED product development. Countless hours have gone into creating tools worthy of the most professional applications, and the Source Four® LED Series 2 luminaire is the result of that dedication. With the brightest output and the boldest rendering of the colors you use most, the Source Four LED Series 2 introduces a whole new level of LED lighting that can be used anywhere. ETC's x7 Color System™ combines a balanced recipe of up to seven colors to create evocative color mixes. The Source Four LED Series 2 Lustr array takes the idea even further, with the addition of a lime-green LED emitter. Lime green increases the luminaire's lumen output in open white and lighter tints to make them brighter and livelier, better matching the color of a conventional Source Four fixture. The lime also enriches color-rendering by better marrying the red and blue ends of the color spectrum, for truer-to-life light that fills in the gaps that ordinary LEDs leave behind. EDLT stands for "Enhanced Definition Lens Tube." 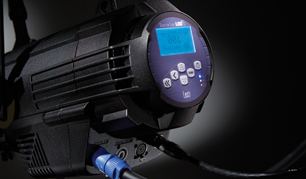 The EDLT gives heightened contrast and edge crispness to projected images, especially when the Source Four is used as a gobo projector.